Warning: The cheese comes in waves! In an over-fed market of goth-chick metal bands, this is just one more offer to place on the shelves in the record stores (those that are left, of course). The German band Arven plays it decent, sure. They've used a violin and a flute here and there and capture a bit of medieval folklore feel, along with elements of Nightwish and Tristania and, yes, the singer does a fine job. 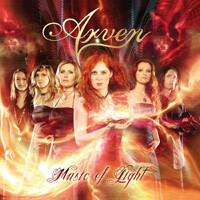 Arven works neatly and properly within the confines of the genre, and that is exactly the issue; I'm so desperately searching for something that makes 'Music of Light' stand out. I'm not succeeding. Considering that there is nothing new what so ever on offer, 51 minutes turn out to be a walk in the desert where you gasp for a well of rejuvenation of a genre in stagnation.